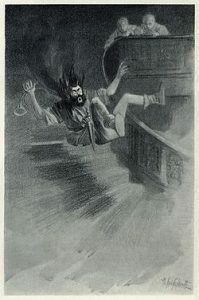 The story of the Canterville ghost was created by Oscar Wilde. It’s fiction. He based it on stories he’d heard from his mother, Jane Francesca Agnes, Lady Wilde. She was among the leading experts in folklore of the British isles. As far as I know, no haunted 19th-century British home is or was named Canterville Chase, and no town in England is named Canterville. The plot is a solid template if you’re writing ghost stories, especially with a romantic twist. My favorite movie version is the one with Sir John Gielgud. He’s every bit as cranky as some ghosts I’ve encountered. The tale makes ghosts less scary to children. That’s a very good thing. LibreVox has several public domain audios of the story, if you’d like to listen to the story. It’s not very long, but it is fun. And, if you search online, you’ll find several ideas for related, stylized stage plays. Previous Previous post: Why is the Lizzie Borden house haunted? Next Next post: What’s it like to live in a haunted house?